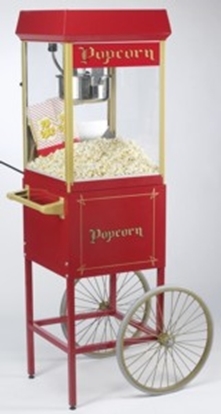 Create the festive party atmosphere with our “Movie Time” vintage popcorn machines that make s the best tasting popcorn with 100% premium corn. We supply pre-portioned popcorn, oil and the popcorn bags, so you have everything you need for perfect theatre-quality or carnival popcorn every time. 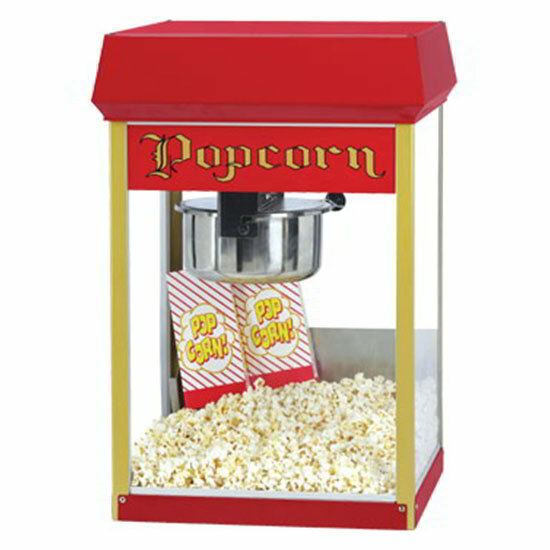 Our popcorn popper is 8 ounces so you can cook popcorn at a fast rate — perfect for hungry crowds! 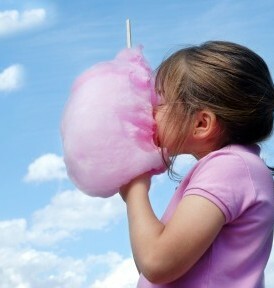 Includes enough supplies for 50 servings. The handy popcorn packs have pre-measured amounts of popcorn, seasoning salt and oil for perfect theater-quality popcorn every time. Simply cut open the top and pour the contents into your heated kettle for hassle-free popping. No measuring, no mess, no clean-up. Additional 50 serving packs available. An electrical outlet within 50′ of the unit. The popcorn machine must be set up on a sturdy table (table not provided) or on the optional popcorn cart.